Landlords are offering more and more deals and incentives to get renters into their apartments — except in Seattle, where rental competition is expected to climb yet again. HotPads reports that there is a national trend of property managers offering more concessions — move-in deals, rental discounts, gift cards, etc. The number of properties making such offers went up by 15.8 percent over the past year. These offers more than doubled in Chicago, Miami, and Atlanta. Managers generally use the incentives to attract renters to their units over their competition. But Seattle presents a different rental story, where demand is still higher than supply. In fact, the area saw a decrease in rental incentives of 9.9 percent. A total of 1.2 percent of all listings in Seattle have been offering concessions, according to HotPad. Renters are more likely to find deals in Portland, which saw an incentive increase of about a quarter. Seattle is not alone. LA, San Diego, and Houston were hit much worse. Washington DC was hit the hardest with a 62 percent decline in rental deals. According to Joshua Clark, an economist at HotPads, the decline in Seattle is not as bad as elsewhere because the incentives were so few to begin with. That’s the good news. But Clark does have a “however” statement. The declines comes within a couple years of the city putting a halt to rent deals for Seattle’s tech elite. Geekwire reported that the city council banned “preferred employer” programs in 2016, which gave cheaper rent and other perks to employees of companies like Microsoft or Amazon. More recently, it was discovered that 40 percent of Seattle landlords were attempting to sell their properties as new city regulations went into effect. New rules included expanded source-of-income protections; a ban on using criminal records to determine who to rent to; restricting the size of security deposits; and the controversial First-in-Time law, which forces landlords to take the first renter who applies and meets the criteria. At the same time, rental growth has slowed in Seattle over the past year with rents going up about 4.3 percent. In 2017, rents went up 7.7 percent. 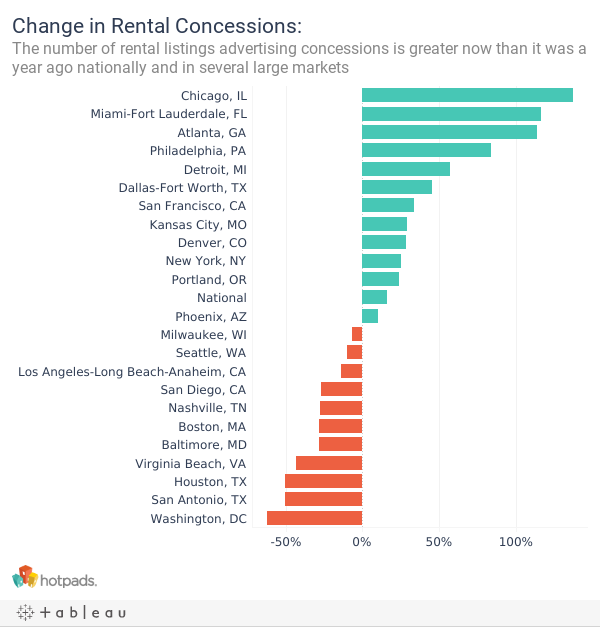 While rent growth slowed in the region, it still remains high. The median rent is currently $2,225 a month. A greater emphasis is also being placed on new condos, a recent trend that has been absent in Seattle for a few years. This factor removes many rentals from the market, further influencing demand.